È uno dei suoi tanti lati oscuri: Caravaggio dipingeva senza disegnare e non voleva essere guardato. Per questo la “bottega”, il luogo in cui nascevano le opere, è sempre rimasto un luogo di misteri e segreti. Ne ricostruisce modalità scientifiche e tecniche la mostra “La bottega del genio” a Palazzo Venezia (fino al 29 maggio). Ideata dalla soprintendente Rossella Vodret per la cura di Claudio Falcucci, propone un´ipotesi di allestimento dello studio di Caravaggio negli anni romani, prendendo spunto dalle fonti contemporanee dell´artista come l´ “Inventario delle robbe” (1605) che comprendeva lenti, specchi e altri strumenti ottici dei quali l´artista si serviva. Quattro le ipotesi di ricostruzione delle tecniche esecutive, con modelli in vetroresina, dalla Canestra di frutta al San Girolamo al Bacchino malato e alla Medusa. Affianca la mostra un ciclo di conferenze. San Girolamo. from Caravaggio. Workshop. Discovering Caravaggio by studying his creative processes in order to understand the revolutionary scope of his painting techniques, which marked a U-turn in not only in the world of 17th century art, but also for the following centuries: the exhibition curated by Rossella Vodret and presented from December 22 to May 29 by the Special Board for the Historic, Artistic and Ethnoanthropological Heritage and for Rome’s Museum network at the 14th Century Rooms of Palazzo Venezia aims at highlighting one of the less known aspects of this artist: his painting technique, which has still not been examined in depth. 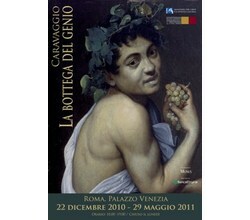 The exhibition, called “Caravaggio. The workshop of the genius” and curated by Claudio Falcucci, comes at the end of the celebrations for the 400th anniversary of the death of the great Lombard painter and highlights the fact that, despite the extensive biography that flourished around the artist, there are still some pages to write about this figure, so dense of emotional pathos and drama and with a life marked by restlessness with murders, escapes and exile, as there is about his works. From this point of view, the exhibition is an “unusual initiative that does not contain works of art but creative itineraries,” says Rossella Vodret. Four itineraries or four hypotheses, formulated on the basis of contemporary sources of the artist by Mancini, Baglione, Sandrart, Bellori as well as on the “inventario delle robbe” of 1605 which listed the artists’ possessions. The four itineraries will incorporate some works, such as the Basket of fruit, St Jerome writing, the Young sick Bacchus and the Medusa, using as models some silicon rubber, fibreglass sculptures made by the Plastikart Studio of Istvan Zimmermann. There will be some interesting elements, which to the modern viewer may seem obvious, but which at the time were a real innovation. To begin with, the light, which is no longer generic and universal, but which usually shines through the works like a ray of light, arriving on the scene and interrupting the silence of the dark background coming down from above and lighting up the dramatic event, right where the action takes place. Characters from the streets, who have lost their idealised and ethereal features and almost boldly present themselves to the viewer with their faults and truths, no longer being able to hide behind the veil of illusion. And what is even more difficult to define, involvement, that special talent that Caravaggio had of attracting attention on every detail, be it a music score, withering fruit or any element that attracts the eye and leads it to enter the painting and plunge into a dimension where there are no more barriers between art and life. Visitors will therefore go through an itinerary that illustrates Caravaggio’s techniques starting from some of the important questions related to how the artist lit up his models, on the ways he used to reproduce them on the canvas, even employing optical instruments including lenses and mirrors and other very interesting themes related to questions that remain unsolved to this day. On the occasion of the exhibition there will also be a series of lectures held by the curators between January and February at Palazzo Venezia on a weekly basis. The lectures, an idea of Vodret herself, will be curated by Marco Cardinali and Maria Beatrice De Ruggieri. The exhibition is organised by Munus and its main sponsor is Banca Etruria.